The unexceptional, ordinary object you see when you look at a thermometer is nothing compared to the work of art that Jasper Johns sees. I’ve never seen a thermometer that moved me to make art about it, but then again, I’m not a famous avant-garde artist. 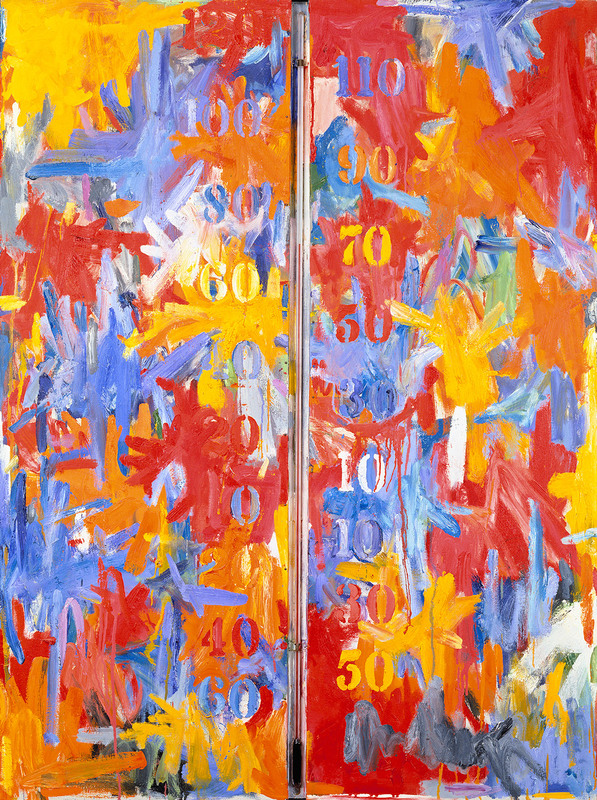 For Jasper Johns it was the art of fellow artist Barnett Newman, coupled with what I imagine must have been a particularly show-stopping thermometer, that moved him to create the artwork titled – you guessed it – Thermometer. Trying to figure out why Johns might have included a thermometer in his work is like wondering why any modern artist does anything. The short answer is, “Why not?” By the late 1950s, Jasper Johns had begun to incorporate what he called “mechanical devices” into his work. Perhaps Johns was trying to make use of ordinary objects for his love interest and creative accomplice Robert Rauschenberg, who loved to do just that. According to Rauschenberg and Johns, though the Abstract Expressionists were interesting, they ultimately had art all wrong. Their grandiose themes of self-expression and focus on the individual were losing stock by the end of the ‘50s. Rauschenberg and Johns became co-conspirators in a plot to return fine art to the realm of the mundane and ordinary, and they used found objects to do so. Instead of overly-indulgent declarations of self, they wanted their art to be as impersonal as possible, so they let objects like flags, thermometers, and goats speak for themselves. The late 1950s were a busy time for this artistic pair. Johns and Rauschenberg traveled to the Philadelphia Museum of Art in 1958 to see the museum’s definitive Marcel Duchamp collection. The following year, Duchamp returned the favor and paid a visit to Johns’ studio. Johns also saw the works of Barnett Newman, whose vertical 'zips' he riffs on with the verticality of the thermometer here. Leo Castelli, who also made artists like Roy Lichtenstein famous by showing their work in his New York gallery, gave Johns a solo show in 1959, jumpstarting his artistic career. Alfred Barr, Jr., the first director of the Museum of Modern Art, bought three paintings in the show to add to the relatively new museum’s budding collection. Johns was pretty much a nobody at this time, so this purchase was a big deal. In response to the reign of Abstract Expressionism, Johns asserted that, in the age of media and information that began in the late 1950s, the artist had to make sense of the barrage of consumable objects and information that was bombarding society. Lest we forget, this was already a problem even before the internet. Using everyday objects and methods such as stenciling in the realm of fine arts played with the idea of artistic authenticity in a joking, yet highly significant, way. The work of Johns and Rauschenberg paved the way for artists like Lichtenstein and Andy Warhol, whose work took the idea of reappropriating images and objects to the next level. Warhol was surely paying attention to the shifts that Jasper Johns was initiating, as he bought a drawing of a lightbulb by Johns in 1961. How’s that for a bright idea? Fineberg, Jonathan. Art Since 1940: Strategies of Being, 3rd edition. Upper Saddle River, NJ: Pearson Education, Inc., 2011. Gompertz, Will. What Are You Looking At? New York: Penguin Group, 2013. Harrison, Charles, and Paul Wood. “Jasper Johns (b. 1930) Interview with David Sylvester.” Art in Theory, 1900–2000: An Anthology of Changing Ideas. Malden, MA: Blackwell Publishing, 2014. Mann, Jon. “Why Jasper Johns Is an Icon of 20th-Century Painting.” Artsy. December 14, 2017. https://www.artsy.net/article/artsy-editorial-jasper-johns-icon-20th-cen.... Accessed February 11, 2019.